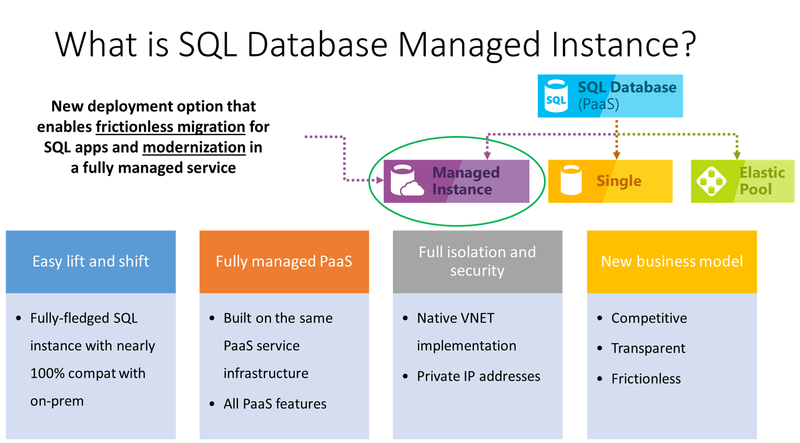 Managed instance is a new deployment option of Azure SQL Database, providing near 100% compatibility with the latest SQL Server on-premises (Enterprise Edition) Database Engine, providing a native virtual network (VNet) implementation that addresses common security concerns, and a business model favorable for on-premises SQL Server customers. The managed instance deployment model allows existing SQL Server customers to lift and shift their on-premises applications to the cloud with minimal application and database changes. At the same time, the managed instance deployment option preserves all PaaS capabilities (automatic patching and version updates, automated backups, high-availability ), that drastically reduces management overhead and TCO. For a list of regions in which the managed instance deployment option is currently available, see supported regions. To decide between the Azure SQL Database deployment options: single database, pooled database, and managed instance, and SQL Server hosted in virtual machine, see how to choose the right version of SQL Server in Azure. A managed instance runs with all of the features of the most recent version of SQL Server, including online operations, automatic plan corrections, and other enterprise performance enhancements. A Comparison of the features available is explained in Feature comparison: Azure SQL Database versus SQL Server. The vCore-based purchasing model for managed instances gives you flexibility, control, transparency, and a straightforward way to translate on-premises workload requirements to the cloud. This model allows you to change compute, memory, and storage based upon your workload needs. The vCore model is also eligible for up to 30 percent savings with the Azure Hybrid Benefit for SQL Server. In vCore model, you can choose between generations of hardware. Gen4 Logical CPUs are based on Intel E5-2673 v3 (Haswell) 2.4-GHz processors, attached SSD, physical cores, 7GB RAM per core, and compute sizes between 8 and 24 vCores. Gen5 Logical CPUs are based on Intel E5-2673 v4 (Broadwell) 2.3-GHz processors, fast NVMe SSD, hyper-threaded logical core, and compute sizes between 8 and 80 cores. Find more information about the difference between hardware generations in managed instance resource limits. General purpose: Designed for applications with typical performance and IO latency requirements. Business critical: Designed for applications with low IO latency requirements and minimal impact of underlying maintenance operations on the workload. Both service tiers guarantee 99.99% availability and enable you to independently select storage size and compute capacity. For more information on the high availability architecture of Azure SQL Database, see High availability and Azure SQL Database. For more information, see storage layer in general purpose tier and storage performance best practices and considerations for managed instances (general purpose). Find more information about the difference between service tiers in managed instance resource limits. Business Critical service tier is built for applications with high IO requirements. It offers highest resilience to failures using several isolated replicas. Built-in high availability based on Always On Availability Groups and Azure Service Fabric. 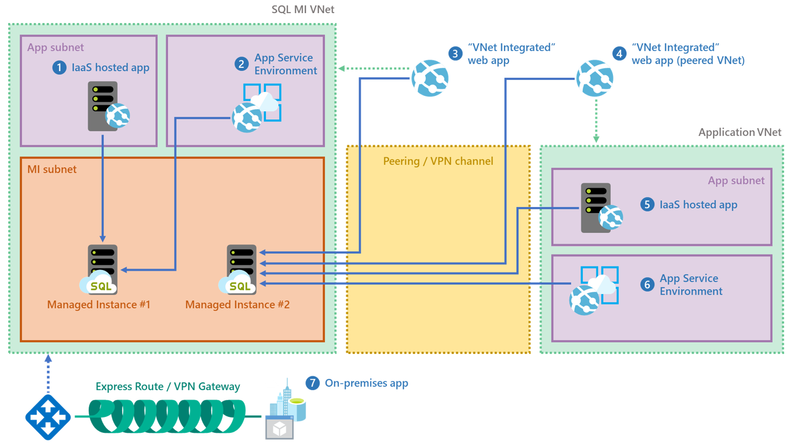 In a default deployment, SQL endpoint is exposed only through a private IP address, allowing safe connectivity from private Azure or hybrid networks. To learn more details about VNet integration and networking policy enforcement at the subnet level, see VNet architecture for managed instances and Connect your application to a managed instance. Place multiple managed instance in the same subnet, wherever that is allowed by your security requirements, as that will bring you additional benefits. Collocating instances in the same subnet will significantly simplify networking infrastructure maintenance and reduce instance provisioning time, since long provisioning duration is associated with the cost of deploying the first managed instance in a subnet. Data encryption in motion - a managed instance secures your data by providing encryption for data in motion using Transport Layer Security. In addition to transport layer security, the managed instance deployment option offers protection of sensitive data in flight, at rest and during query processing with Always Encrypted. Always Encrypted is an industry-first that offers unparalleled data security against breaches involving the theft of critical data. For example, with Always Encrypted, credit card numbers are stored encrypted in the database always, even during query processing, allowing decryption at the point of use by authorized staff or applications that need to process that data. Migration of an encrypted database to a managed instance is supported via the Azure Database Migration Service (DMS) or native restore. If you plan to migrate an encrypted database using native restore, migration of the existing TDE certificate from the SQL Server on-premises or SQL Server in a virtual machine to a managed instance is a required step. For more information about migration options, see SQL Server instance migration to managed instance. The managed instance deployment option supports traditional SQL server Database engine logins and logins integrated with Azure Active Directory (AAD). Azure AD server principals (logins) (public preview) are Azure cloud version of on-premises database logins that you are using in your on-premises environment. Azure AD server principals (logins) enables you to specify users and groups from your Azure Active Directory tenant as true instance-scoped principals, capable of performing any instance-level operation, including cross-database queries within the same managed instance. A new syntax is introduced to create Azure AD server principals (logins) (public preview), FROM EXTERNAL PROVIDER. For more information on the syntax, see CREATE LOGIN, and review the Provision an Azure Active Directory administrator for your managed instance article. The managed instance deployment option enables you to centrally manage identities of database user and other Microsoft services with Azure Active Directory integration. This capability simplified permission management and enhances security. Azure Active Directory supports multi-factor authentication (MFA) to increase data and application security while supporting a single sign-on process. This authentication method uses a username and password. This authentication method uses identities managed by Azure Active Directory and is supported for managed and integrated domains. Use Active Directory authentication (integrated security) whenever possible. Authorization refers to what a user can do within an Azure SQL Database, and is controlled by your user account's database role memberships and object-level permissions. A Managed instance has same authorization capabilities as SQL Server 2017. The migration approach leverages SQL backups to Azure Blob storage. Backups stored in Azure storage blob can be directly restored into a managed instance using the T-SQL RESTORE command. For a quickstart showing how to restore the Wide World Importers - Standard database backup file, see Restore a backup file to a managed instance. This quickstart shows you have to upload a backup file to Azure blog storage and secure it using a Shared access signature (SAS) key. For information about restore from URL, see Native RESTORE from URL. Backups from a managed instance can only be restored to another managed instance. They cannot be restored to an on-premises SQL Server or to a single database/elastic pool. The Azure Database Migration Service is a fully managed service designed to enable seamless migrations from multiple database sources to Azure Data platforms with minimal downtime. This service streamlines the tasks required to move existing third party and SQL Server databases to Azure SQL Database (single databases, pooled databases in elastic pools, and instance databases in a managed instance) and SQL Server in Azure VM. See How to migrate your on-premises database to managed instance using DMS. The managed instance deployment option aims to deliver close to 100% surface area compatibility with on-premises SQL Server coming in stages until service general availability. For a features and comparison list, see SQL Database feature comparison, and for a list of T-SQL differences in managed instances versus SQL Server, see managed instance T-SQL differences from SQL Server. The managed instance deployment option supports backward compatibility to SQL 2008 databases. Direct migration from SQL 2005 database servers is supported, compatibility level for migrated SQL 2005 databases are updated to SQL 2008. High-availability is built in and pre-configured using technology similar to Always On Availability Groups. Automated backups and point in time restore. Customer can initiate copy-only backups that do not interfere with automatic backup chain. Managed instance does not allow specifying full physical paths so all corresponding scenarios have to be supported differently: RESTORE DB does not support WITH MOVE, CREATE DB doesn’t allow physical paths, BULK INSERT works with Azure Blobs only, etc. Managed instance supports Azure AD authentication as cloud alternative to Windows authentication. Managed instance supports SQL Server Integration Services (SSIS) and can host SSIS catalog (SSISDB) that stores SSIS packages, but they are executed on a managed Azure-SSIS Integration Runtime (IR) in Azure Data Factory (ADF), see Create Azure-SSIS IR in ADF. To compare the SSIS features in SQL Database, see Compare Azure SQL Database single databases/elastic pools and managed instance. The managed instance deployment option enables system administrator to spend less time on administrative tasks because the SQL Database service either performs them for you or greatly simplifies those tasks. For example, OS / RDBMS installation and patching, dynamic instance resizing and configuration, backups, database replication (including system databases), high availability configuration, and configuration of health and performance monitoring data streams. The following table shows several properties, accessible through Transact SQL, that you can use to detect that your application is working with managed instance and retrieve important properties. @@VERSION Microsoft SQL Azure (RTM) - 12.0.2000.8 2018-03-07 Copyright (C) 2018 Microsoft Corporation. This value is same as in SQL Database. SERVERPROPERTY ('Edition') SQL Azure This value is same as in SQL Database. SERVERPROPERTY('EngineEdition') 8 This value uniquely identifies a managed instance. To learn how to create your first managed instance, see Quickstart guide. For a features and comparison list, see SQL common features. For more information about VNet configuration, see managed instance VNet configuration. For a quickstart that creates a managed instance and restores a database from a backup file, see create a managed instance. For a tutorial using the Azure Database Migration Service (DMS) for migration, see managed instance migration using DMS. For pricing information, see SQL Database managed instance pricing.